Crafted from the minds of just three developers, Astro Port’s Satazius (SA- taze-ee-us) encapsulates my boyhood dream of building the most “awesomest” game ever. But what was once the “awesomest” is now fairly pedestrian, and the structure, although solid, feels undefined. The game is a tribute to the TurboGrafx/Master System era of shooters that mimics them almost too convincingly, becoming a simulacrum of yesteryear shoot’em ups at the cost of an identity. Satazius is like a cardboard standee propped in front of a roller coaster, boasting that you must be “at least this nostalgic to enjoy.” Despite it all, I still get a kick out of Satazius and the game demonstrates the basic elements of the shoot’em up genre and why I love them so. What could be more fitting for the inaugural installment of Shoot’em Up Sunday? Everything you ever wanted to know about the world of Satazius can be found in the digital manual. There’s no book series, graphic novel, Saturday morning cartoon, or live action movie tie-ins. There are no hidden voice-recorders that you need to discover in order to piece together a mosaic narrative. In fact, there isn’t a shred of explicit story to be found in the game proper! All you need to know is that your ship, the Trafalgar, escaped from a bigger ship that was shot down by a group of space pirates from the titular planet Satazius. Your crew calculates a 0.02% chance of survival if you try to escape and a 1% chance of survival if you fight the pirates head on. These numbers are canon—download the manual if you find me untrustworthy. The algorithm used to determine these dire percentages are a mystery, but I’d assume that your crew is a cabal of mathematicians and engineers who’ve probably remembered to solve for “X.” That’s the beauty of the implicit story-telling found in most shoot’em ups. More often than not, a convoluted story can hinder your enjoyment of a game when it stumbles in front of gameplay. Don’t get me wrong; videogames are a wonderful storytelling medium, but few programmers are wonderful writers, and I’ll always prefer a minimal, elegant story to a long-winded one. Speaking of which, are you going to let those eggheads tell you how to survive? Take that 1% chance by the scruff and show it the door! It’s time to shoot all things!! 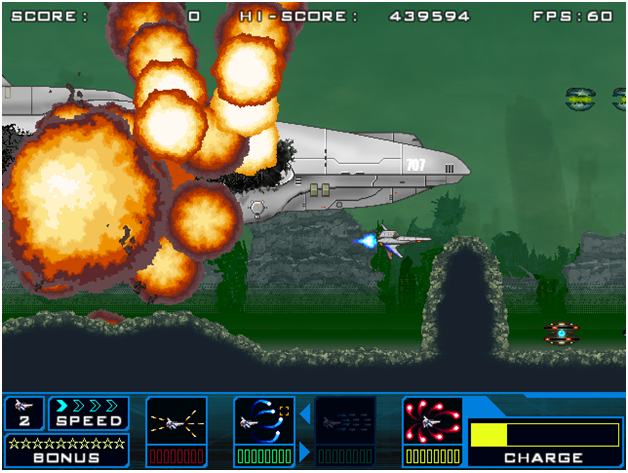 Shoot’em ups live and die by their ability to get the player’s thumb off of the shoot button. You’ll simply lose interest if taping your thumb to your controller wins the day. Shooters are about split second decisions and the skill to execute. Having multiple options tied to different buttons makes you feel like you’re actually piloting a sophisticated murder ship. 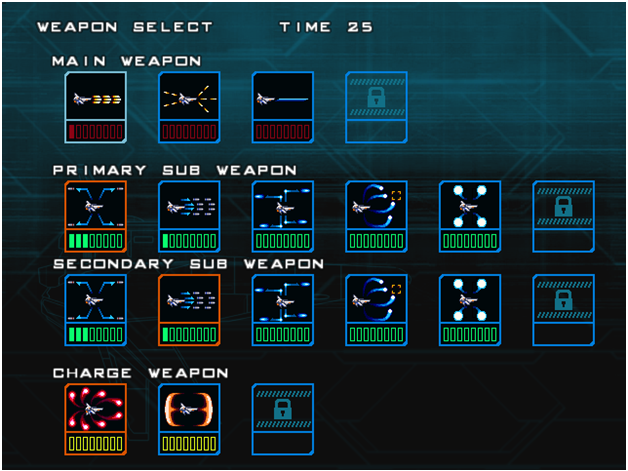 Satazius offers 12 weapons to choose from the start. In addition to a main shoot button, you can cycle between two subs with a second button, and use a third button for a charge weapon that acts as your ace in the hole. You’ll eventually collect 19 weapons total as new weapons unlock after boss battles. The variety presents enough tactical difference to ensure that you can adhere to your specific play style. Each weapon can be leveled up by collecting power-ups. You’ll be rewarded for using different weapons from stage to stage as the weapon levels carry over. The levels of equipped weapons decrease if you explode, making it difficult to come back during later stages. So here’s a tip—don’t explode. I have a similar tip for Golf. Shooters are about sharpening each playthrough like a katana and Satazius has a modest number of tricks in its folds. Bosses become multi-form beasts later on and each stage adds a signature hazard to quell some of the monotony. Meteor clusters, lava geysers, portals, and crushers all make appearances. 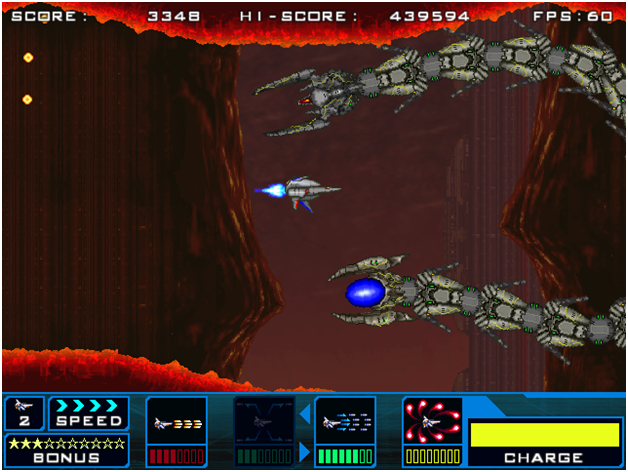 The practice mode allows for multiple runs for a stage you reached, but may not have finished. Practice mode also lets you adjust the level of your weapons and speed, giving you an idea of what level your weapons should be when the time comes. Nothing is more satisfying when playing a shooter than mastering its secrets and having that perfect run where your friends question the hit box on your ship. Every great run is born from countless deaths and the sheer will to overcome one the oldest and most difficult genres in gaming. It won’t be apparent at first that some weapons are more valuable than others throughout the six stages in Satazius, but you’ll be playing through this game hundreds of times trying to discover what weapons are ideal for each situation. Just don’t let that giant goddamn space centipede get you down. He’ll get his! Satazius will never be a classic, but it accomplishes its goal of reminding us why the shoot’em up genre has endured for so long. Elegant story-telling, skill-based gameplay, and unrelenting challenge keep the niche shooter crowd happy, but the future of these games lies in how the next generation integrates these elements with new ideas and technology. We only get a handful of these titles every year and the only companies who develop them are indie developers like Astro Port who are willing to put passion before profit. 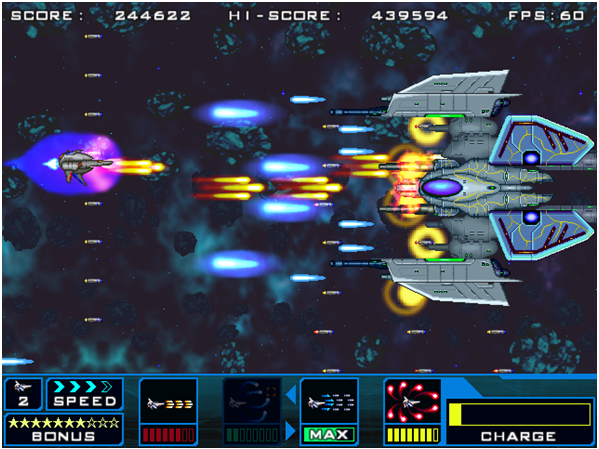 So how do you want to see shoot’em ups shape up? What are some of the reasons you come back time and time again to your favorite shooter? 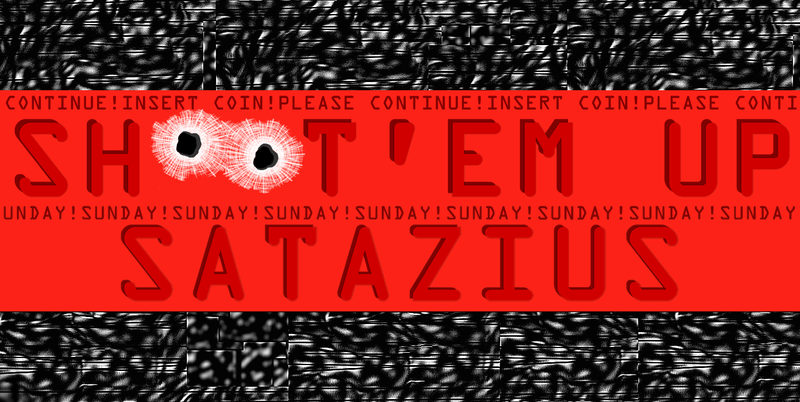 Let everyone know in the comments section below and I’ll see you here on the last Sunday of every month for more installments of Shoot’em Up Sunday!